Lindy’s Stamp Gang’s February Color Challenge! Welcome to the February color challenge! We’re so glad you’re here! If this is your first time hearing about our color challenge, please check out the info section on our blog: Color Challenge Info. Help us spread the word! Share our color challenge graphic in your blog post and link to the Lindy’s Stamp Gang blog, where the challenge can be found. Link the Lindy products you used to the Lindy’s Stamp Gang store, like this: Hibiscus Rose. 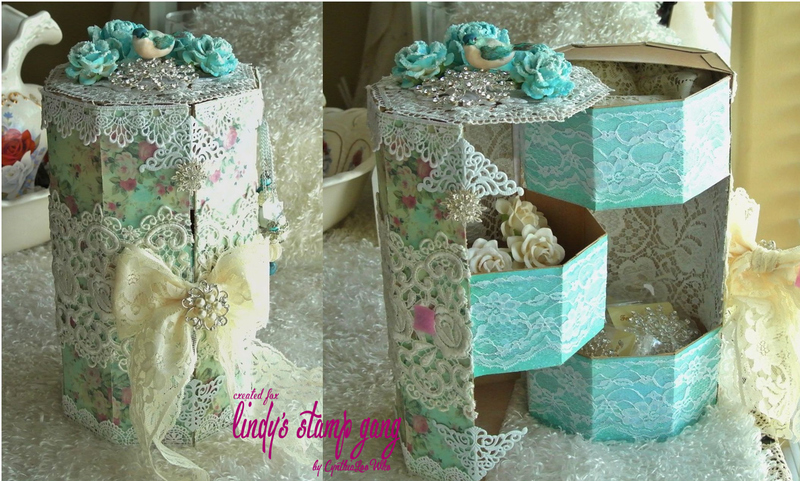 For every 50 entries LSG will giveaway a $50.00 gift certificate for Lindy’s Stamp Gang products! 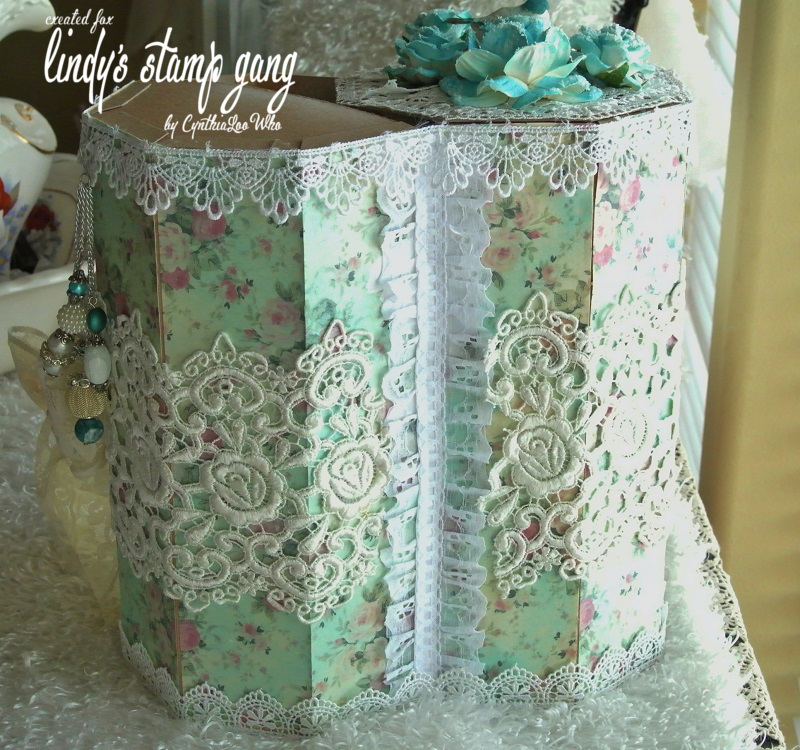 You must enter on the Lindy’s Stamp Gang blog <—— Click Here! Each month Lindy’s puts on a Color Challenge, though you are welcome to use your own creativity in picking colors, we thought we’d also create a set if you don’t want to “think” too much about which colors to use! You get 5 Starburst Sprays and their matching Embossing Powder at a reduced cost for a LIMITED TIME! Here is my project for inspiration! I made an octagon box with 3 compartments to store my filigrees. I have a lot!!!! I wanted something pretty but could take some abuse because I will be using it a lot. 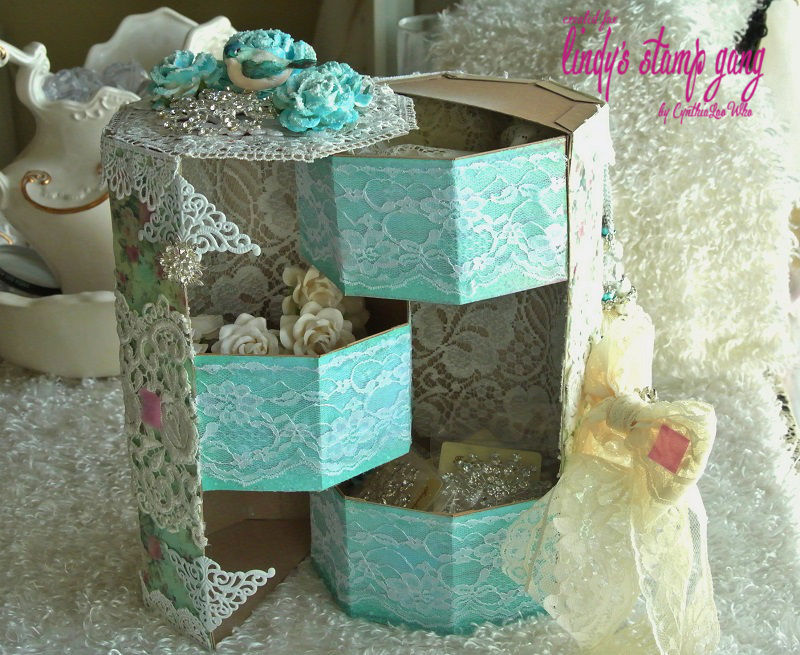 I used .22 weight (light) chipboard to construct the box and compartments and covered the outside and compartments with paper I colored with Lindy’s Stamp Gang’s Time Travel Teal Starburst spray and then I lightened it a bit with Frozen Jack Frost Starburst. 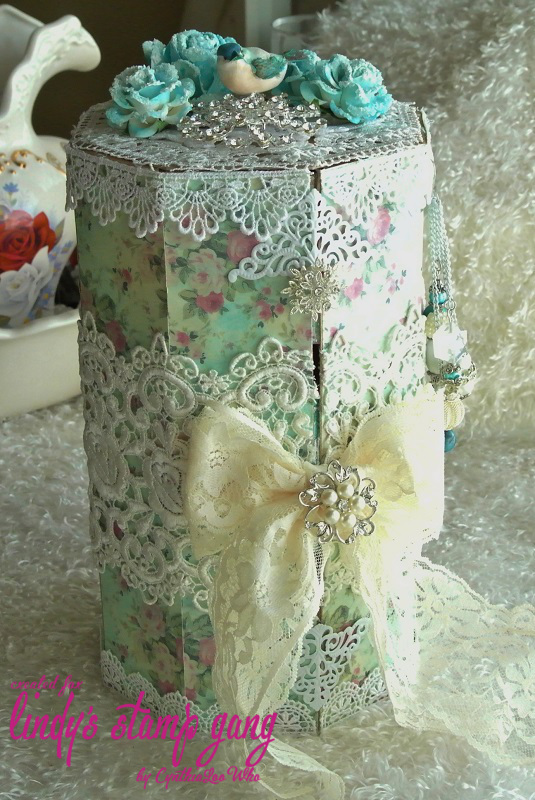 Once I finished the construction I got to decorate (my favorite part) I added a big lace bow for the closure. I used velcro on the bow to close it, I thought that would be easy to open and close with one hand. 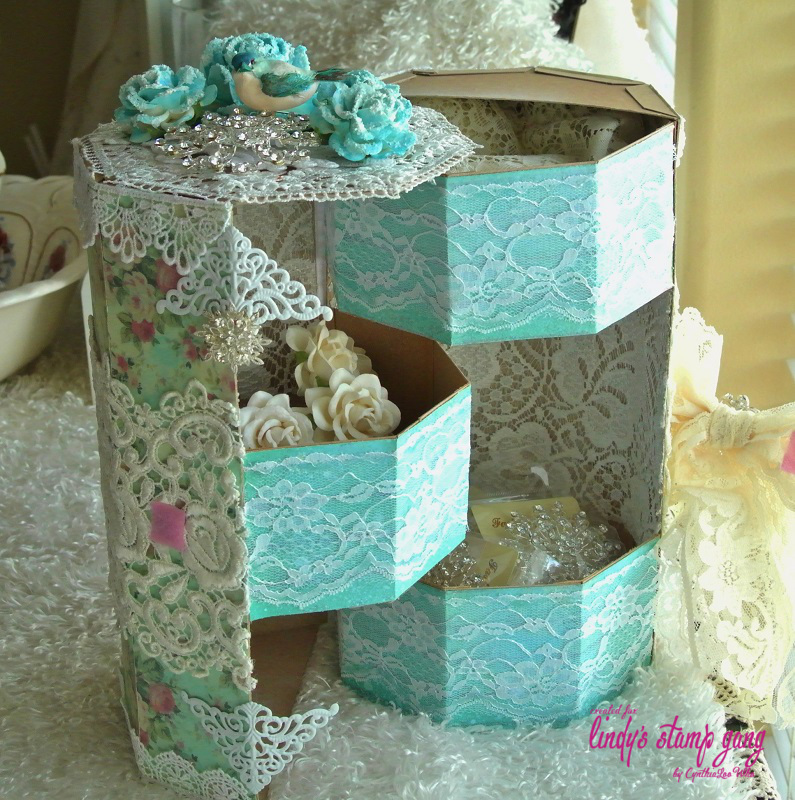 I added some gorgeous wide white lace from Tresors De Luxe. I made a charm with some color coordinating beads, crystals, and chain. Then for the top I used some beautiful I Am Roses, roses and colored them with Time Travel Teal, Frozen Jack Frost and then sprinkled them with Diamond dust with some acrylic paint for a frosty look. I also added a beautiful large brooch from my sweet friend Julie and a little birdie colored with Time Travel Teal. Previous #lindysgang Epic Giveaway on Instagram! Is the Octagon Box template on sale anywhere?